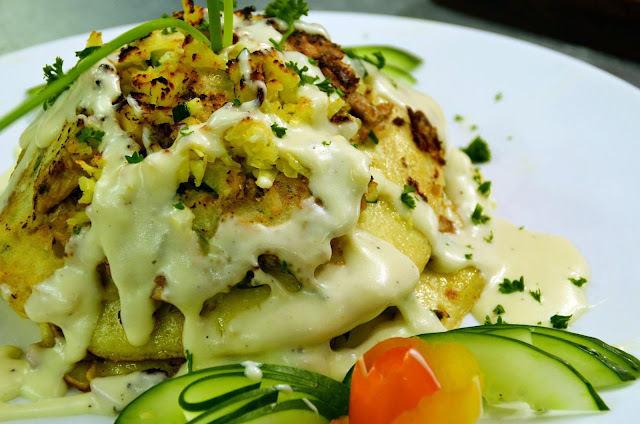 Savory Stuffed Pancakes not only has the savory goodness of pancakes, it even has salmon and a ton of cheese designed to blow the blues away. Showbz sisters Ehra an Michelle Madrigal grab the grub and demolish it in a jiffy. 1. Take a bowl and sift flour and salt. 2. Beat in eggs and pour milk to make a smooth paste. Pour the remaining milk. 3. To make the stuffing, melt butter in a pan and stir fry flour. Cook for a minute and pour in milk. Let it boil until it thickens. 4. Season with salt and pepper and add salmon, spring onions, and cucumber to the sauce. 5. Melt fat in a frying pan and shallow fry 2 or 3 tablespoon of the batter. 6. Cook one side for a minute and top with seafood. Then turn the pancakes so that both sides are cooked well. 7. Continue frying pancakes in the same way and keep stacking one upon another with a greased paper in between each layer. 8. Serve hot with maple syrup or the thickened seafood sauce.